Art With Heart Team Showcase: 8 ways with the Stampin' Up! Rose Wonder Stamp set / Rose Garden Thinlets. Myself and many of the clever ladies in my Art With Heart Stampin' Up! team have been playing with the Rose Wonder stamp set and Rose Garden Thinlit Dies from the 2016 Stampin' Up! Occasions Catalogue. Now here's a look at some of the way we have used this bundle. This one is by me, I chose to just use the Framelits here. My DSP is from the Love Blooms DSP stack, and my color are Crumb Cake and Rose Red. My greeting is from Party with Cake, which is one of my favourites birthday greeting sets at the moment (LOVE the typewriter font). My colour scheme is Rose Red and Crumb Cake, with the patterned paper from the Love Blossoms DSP stack. My greeting is from Party with Cake stamp set because I am totally in love with the typewriter font and all the birthday sentiments in this set. This next card is by Kathryn Mangledorf in South Australia, Kathryn has used the inside cut outs from the Framelits. Learn how on Kathryn's blog post about this card here. Kathryn does regular classes in the Adelaide Hills. These next two are by Rachel Woollard, who does regular classes and catalogue launches in Ringwood East Victoria. I particularly love how Rachel has layered the stamped and die cut leaves on this first card. Patterned DSP make a fabulous backing for the die cut rose too. These two cards were created by Genna Gifford in Pakenham, for her recent catalogue launch. Isn't this amazing? Genna does classes and catalogue launches. This bundle also is a great one for making sympathy cards. Here's another card by Genna. 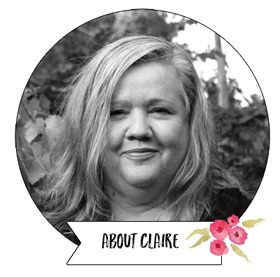 Ros Davidson is another team member who does classes in Skye, south east Melbourne. Ros loved Genna's first card, and wanted to case it. Finally, here's another card by me. In this card I only wanted to use the single branch from the Framelits. I hope you have liked this group of project using the Rose Wonder bundle, and you enjoyed visiting my talented teams blogs. You can view some of the product in the links below my post. Want to hear more from me? Subscribe to my blog to never miss a post HERE. Saleabration joining bonus. Get $295 worth of goodies and free postage for just $169! 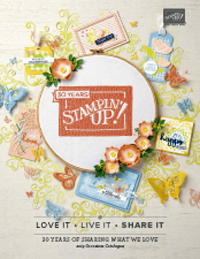 That's a 45% initial discount, plus ongoing discounts, great new crafty friends and opportunities to attend Stampin' Up! events and earn free product when you join to save money and/or earn money. More detail HERE. Today's card comes to you courtesy of the Hello Stamp set which is one of the free choices in the 2016 Saleabration Catalogue (just spend $90 in one order and choose an item free). The majority of the catalogue I available until 31st March, but this particular stamp set finishes February 15th. So get in quick if you want this one for free. I have used the Love Blossoms 6x6" DSP paper stack, along with some of the matching embellishments in the Love Blossoms Embellishment Kit. Finally starting to feel like I'm settling back into routine. It's the start of my boys second week back at school, and I think I've mastered the book covering, term sports signups / payments, the getting back to waking up at a decent hour (OK, so not quite mastered that one, lol). On Friday night I exhaled after the first week back and did some creating. So nice to just spend some 'me' time doing something I love. 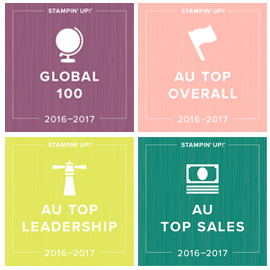 This is one of the FREE Saleabration 2016 stamp sets you can earn until the 31st March with a $90 order. I really like it, and I love having 'just for you' cards on hand as they are suitable for so many occasions. I gold embossed it straight onto some Perfectly Artistic Designer Series Paper (another free choice for Saleabration with a $90 order - this one is only available until 15th Feb though). The Bow Paper clips are super cute too. Subscribe to my blog to never miss a post HERE. Hello. I'm back from a couple of weeks family holiday down on the beautiful Mornington Peninsula and the boys are both back at school this morning so I'm raring to go on a creative 2016! One of my intentions this year is to send more of the cards I make! 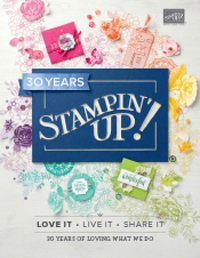 It all started with one of my fabulous Stampin' Up! friends, Shannon West, vowing to #imbringingbirthdaysback by sending handmade cards and not just wishing people happy birthday on Facebook. Now THAT was a bandwagon I wanted to be on! There really is nothing like a handmade card to brighten someone's day. Anyone with me on that goal? I'm aiming to send 200 cards this year, and am off to a good start with 14 cards in the mail last month. I'll keep you posted with my total during the year. I know I can do this. Imagine all the samples I will have to share too! Here's a birthday card I completed this week using the Party with Cake stamp set, and It's My Party DSP from the 2016 Occasions Catalogue. I've also added a balloon using the new balloon punch which cut 2 size of balloons (how easy can birthday cards get?). I'm looking forward to sending this on it's way to someone very soon.